Along with Darren’s Grovedale supporters, Darren had numerous fans in Grande Prairie and they too tracked his progress whenever possible. In the Herald Tribune’s musty archives, Stan Neufeld resurrected records containing articles of Darren’s hockey adventures reported in the Tribune by writers such as Randy Poulis, Todd Maxwell, Kevin Pilling and Jeff Mc Coshen. An undated article by McCoshen reported that twenty-year old McAusland left Seattle for the Washington Capitals Training Camp in the fall of 1992 facing an uncertain future. Following up shortly thereafter, he notified his readers that Darren had signed a contract with the Washington Capitals. It was another important benchmark in Darren’s career – he was a professional. Playing with NHL veterans such as Al Iafrate and Mike Ridley during training camp was a bit daunting to begin with. “At first,” said Darren, “I was not too relaxed but in the second half I did a little better. I popped in a goal during a scrimmage and earned five stitches on my eyelid while deflecting a puck into the net.” Darren played on a line with Michael Pivonka and against NHL hockey legends such as Iafrate, Dale Hunter, Don Beaupre and Rod Langway. In the fall of 1993 he played three pre-season NHL games against Buffalo, Ottawa and Toronto. He reported that playing in the Maple Leaf Gardens was a special experience: one he will never forget. Darren’s 1992 – 93 season in the American Hockey League (AHL) began with the Baltimore Skipjacks, an affiliate of the Washington Capitals. Unfortunately his first season ended early with a broken ankle. 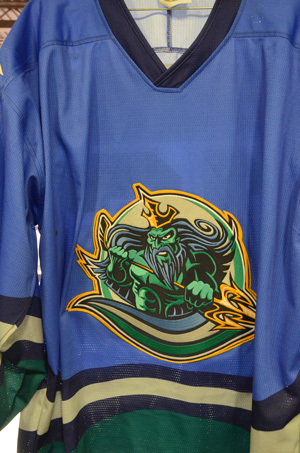 The following year the franchise was moved to Portland, Maine and became the Portland Pirates. In Portland, his home for the next four years, he played under the coaching of Barry Trotz and Paul Gardner. Another highlight in Darren’s career came in the 1993 – 94 season when the Pirates won the Calder Cup, “in part”, said coach Trotz “because Darren was part of the team. “ That team included future NHL stars Olaf Kolzig, Byron Dafoe, Jason Allison, Andrew Brunette and Jason Wooley. They came within one game of winning a second Calder Cup in 1996 losing to the Rochester Americans in game seven. During their 1996 play-off run Darren accumulated eleven points in 21 games. It was Darren’s best season with the Pirates, posting 31 points in 69 games. It was also during this season that Darren made the transition from left wing to defence. Andrew Brunette, currently Assistant Coach and Hockey Operations Advisor with the Minnesota Wild, was a Pirate and Darren’s roommate for a portion of his sojourn in Portland. In an interview with Stan Neufeld, Andrew echoed the sentiments of coach Trotz concerning Darren. He was unselfish, the consummate team player, talented, versatile and a great roommate. The Washington Capitals were unusually deep in talent in that era. Andrew contends that if Darren had been with any other NHL organization at that time he would have an NHL resume today. There is also no doubt that a broken ankle in March of his first season as a professional interfered with his progress. Darren recognized that his stature, 5’11” and 180 pounds, was likely the main reason he was not invited to play in the NHL. However, Portland fans saw something in Darren that NHL scouts failed to see. Twice he was selected as the team’s Unsung Hero: the player fans believed had surpassed all expectations to be one of the club’s most valuable assets. In 2003, he was one of sixteen former players to be selected to the Decade Team for contributions to the success and popularity of Pirates hockey in Portland. Following the completion of Darren’s fourth season with the Pirates his dream of playing in the NHL was dwindling. An undated article in the Herald Tribune reported that an appealing invitation to play in Europe followed the visit of the Coach and GM of the Berlin Capitals. He had come to see his son, Stefane Usdorf, Darren’s teammate, play and to scout Darren. Both were offered a contract to play in Berlin the following season. “It’s a great opportunity for me to have a second career,” said Darren. “ The larger ice surface is more suited to my game, which is skating and shooting. 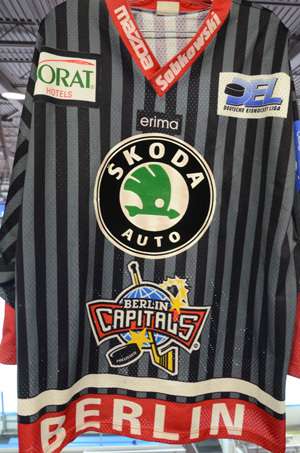 It’s a sound financial decision and a chance to see the world.” The German elite League was replete with former NHL players trying to play their way back into the NHL. In Berlin he would be joining former NHL stars Brian Bellows and Toni Tanti. Darren admitted that he would miss Portland where he had many good friends. In 512 AHL games he accumulated 310 points: 119 goals and 191 assists: that is especially remarkable considering he was moving back and forth from left wing to defence. Interestingly in April of 1998 an article appeared in the Grande Prairie Herald concerning Darren and the next move in his hockey career written by his childhood buddy, Scott Seymour who was then Sports Editor for the Grande Prairie Herald Tribune. Fred Rinne, Editor in Chief and Scott’s boss had heard of Darren before he moved to Grande Prairie. When Scott joined his staff,Fred directed him to write a feature story on Darren little knowing, said Fred, about the “Grovedale Mafia connection.” Upon receiving the assignment Scott, tongue in cheek replied, “Yea, I think I know the guy.” Once again, Scott was in a position to officially write about his long-time friend’s professional hockey career. Scott reported that Darren had often considered playing in Europe and playing in Berlin had turned out to be a lot of fun. Clearly it was a high caliber of hockey ranked only behind the Swedish and Russian Elite Leagues. However, the Capitals failed to make the playoffs. That was a new experience for Darren as teams with whom he had played prior to his move to Berlin had always made the playoffs. Scott noted that Darren would be spending time painting a new Portland townhouse that he had purchased and engaging other interests such as golf, tennis, softball, time in the gym and movies. We are not told if the townhouse paint job was completed but a later Tribune article by Andy Costigan announced that Darren would play his next season (1998 – 99) with the Newcastle Riverkings in the British Ice Hockey Super League. Darren reminisced that he had enjoyed playing in Germany and that he liked the city of Berlin. He witnessed the intense fan rivalry when the Capitals from West Berlin met the East Eisbaren from the other side of town. “Oh yea,” said Darren, “it was pretty intense. It was huge among the fans and they made the game very exciting. There was always a packed house and a great atmosphere.” As for his next move in 1998 Darren told Costigan, “I like Newcastle and I’ve tried to see some of the local sights. I just wish we saw a little more of the sun and maybe a little less rain.” When he left Portland Darren was interested in seeing more of the world and that dream was unfolding. In Newcastle he recorded 24 points in 36 games including fourteen goals He was voted the Best Import Player, Top Defenceman, Player of the Year and perhaps the most coveted of all awards, Players’ Player of the Year. The year 1999 was the beginning of several jet-setting years and the winding down of his hockey career. Still, he continued to make valuable contributions everywhere he played. 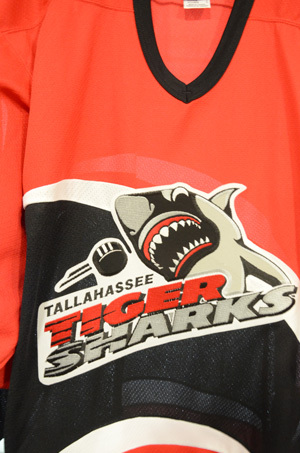 In the 1999-2000 season he played in Tallahassee, Florida for the Tiger Sharks in the East Coast Hockey League recording 31 points in 63 games. Once again he was honoured with the Unsung Hero Award. Future NHL Stanley Cup winner Michael Ryder was a teammate. The following season (2000-2001) he was back in Newcastle playing for their team with a new name: the Jesters. Following another productive year he was selected to represent the Jesters in the Super League All-Star game. Darren played the final two years of his career as a player and Assistant Coach with the Cottonmouths of Columbus, Georgia. He contributed 55 points in 141 games. He retired officially following his final game with the Cottonmouths in 2003. Anyone having much to do with hockey players at any level is aware that superstitions and ritualistic behaviour is an important aspect of preparation for a game. One mystery that may never be solved is the role played by black magic in Darren’s success as a hockey player. “My main superstition,” reports Darren, “was the way I put my gear on – the same way every time - left shin pad first and so on.” If there were other rituals Darren is not sharing them.